Such is the raw and painful nature of the recent allegations of domestic violence against Ben Barba, and rightly, the sensitivity in our society with respect to these matters. Yet it begs attention, because if domestic violence numbers are going to be reduced, a high profile allegation such as this requires coverage. The alleged incident and the resulting ban of Barba is in the public domain already. Barba’s profile, and the relatively public nature of the incident have assured that. It is important to consider the impact of the media coverage and the punishment handed down, and how these factors can make a positive difference to what is sadly a recurring problem in our culture. For his partner, it is likely heart-breaking that this is the case. It is not possible to even contemplate what Ainslie Currie is going through, unless you have walked in those shoes. The views here are not intended to offend, and if they are in any way insensitive to Ms Currie or other victims of domestic violence, deepest apologies are offered. What the publication of these allegations means is that we have an obligation to discuss how we can work to eradicate this behaviour from homes and relationships, and whether sporting codes can play a role. Most importantly, the exposure of Barba’s alleged behaviour and the resulting conversation may just change the path of some impressionable youngsters. The allegations against Barba remain allegations only. Media reports suggest that CCTV evidence supports the allegations. The de-registering of Barba by Todd Greenberg and the NRL has been reported to be based on a viewing of the CCTV. Nobody in their right mind would do anything other than applaud Greenberg’s stance. He acted swiftly and with confidence. One would assume he put aside any doubts about his rights to act on an allegation and simply did what he considers to be right, based on what he saw. In corporate life, there are myriad opportunities requiring a sense of judgement and timing that requires the leader to act decisively. Greenberg and the NRL pass this one with flying colours. The ongoing issue for the NRL, and Greenberg as its most senior executive, is how they make a difference. The Barba banning is a start. The White Ribbon partnership is an excellent initiative, and indeed, the NRL must be mortified when domestic violence occurs, especially within its own ranks. The challenge now for the NRL is how to make a difference that is tangible. Every NRL player who abuses their partner makes a mockery of the NRL’s White Ribbon partnership. However if they are no longer welcome to play, and lose everything they have worked and trained for, you would hope that this starts to make an impact. It is not so much the current crop of players on whom this may make a meaningful impression. The younger and still impressionable generation have surely had their moral compasses fine-tuned by the publication of this allegation and the resulting sanction on Barba. It is simplistic and plain wrong to say that the consequences for Barba’s career are the main way to show our youth the reason not to perpetrate domestic violence. We rely on values, standards and decency to ensure that domestic violence has no place in our community. Punitive measures against offenders are hopefully not a deterrent, because we would hope that people simply wouldn’t behave this way in the first place. The many relationships where violence and abuse are not part of the landscape are not so simply because there would be punitive consequence for the potential abuser. These relationships devoid of domestic violence exist more so because people know it is a heinous act, because they respect and value each other, and live their lives according to basic standards of human decency. However it is in fact the attention given to the allegations against Ben Barba that has value in the conversation about domestic violence. The coverage of the Barba case reinforces to impressionable minds that this behaviour is totally abhorrent, and the consequences for Barba demonstrate that domestic violence cannot ever be tolerated, regardless of the offender’s profile, his value to a sporting team and its fans, or his talent. The allegations show that domestic violence is not limited to specific income brackets or demographics and the issued should never be tackled this way. The publicity around Barba sends the message that domestic violence is never acceptable, and is so taboo as to make the transgressor instantly a persona non grata. Today’s youth need to hear this and understand it. These are powerful and important messages arising out of a horrible story. The question of why an abused partner stays in a relationship over a long period of time is not for discussion here. It’s a complex and difficult discussion, but that’s not why it won’t be discussed. Rather, these conversations need to be had and need to be had repeatedly until they are truly understood. However it is a conversation for those qualified by their own terrible experience, and qualified by professional endeavour. Victims need a supportive, private, and non-judgemental environment. Hopefully our society is resourced for this, and if it is not adequately set up to provide this to victims, this is where high profile organisations can play a role in helping governments to build these resources. The NRL is one such organisation but by no means the only one. Equally, the question of why anyone is abusive to their partner is vital. Arguably, Barba is an important case study. In 2013, there were loud whispers that a similar incident had occurred. It was denied and in effect, remains nothing more than a rumour. Barba now has two rumoured but unproven domestic violence incidents which took place over half a decade apart. Again, nothing has been proven. This case and many others beg the question, what creates an abuser? What part of the moral compass goes askew, how does this happen, and when? If there is an incident, how is the abuser helped? As much as they have committed one of the ultimate taboos and deserve their pariah status, the perpetrator must be helped as much as the victim. Treatment for the causative behaviours is as important as career sanctions, albeit much more private in nature. There would be a strong argument that the abusive person is owed nothing. However by providing remedial treatment we give the best chance to prevent a recurrence of this individual’s behaviour. It is not known what Barba did in this regard after 2013, or what remediation his employer offered him at the time. It is well known that the Brisbane Broncos jumped on the opportunity for Barba to play for them, when the Canterbury Bulldogs essentially let their superstar player walk, in the aftermath of the 2013 allegation. Current allegations provide a strong indication that no lessons were learned out of 2013, when arguably there was a distinct lack of consequence. The exception is Greenberg. He may not have had the same evidence to support the 2013 allegations that he does now, and his role at the Bulldogs had less jurisdiction than his present job, but the sense is strongly that he is a more confident executive now, who grasps the example that he can set with Barba. It seems he is acutely aware of how his actions can make a positive difference to impressionable minds on an issue more critical than pretty much any other he will deal with in this role. Barba the footballer was gifted, at times genial. He brought success to most of his teams through sheer talent. His abilities were rare and were extremely prized. It’s why he had no trouble finding contract after contract despite the growing misgivings about his character with every additional indiscretion. How sad that at 29, we speak about his football career in the past tense, yet given what is alleged to have occurred, how very appropriate. There is a sense of justice and even relief that this allegation is simply too awful to be tolerated, and the game’s governing body saw it this way too. 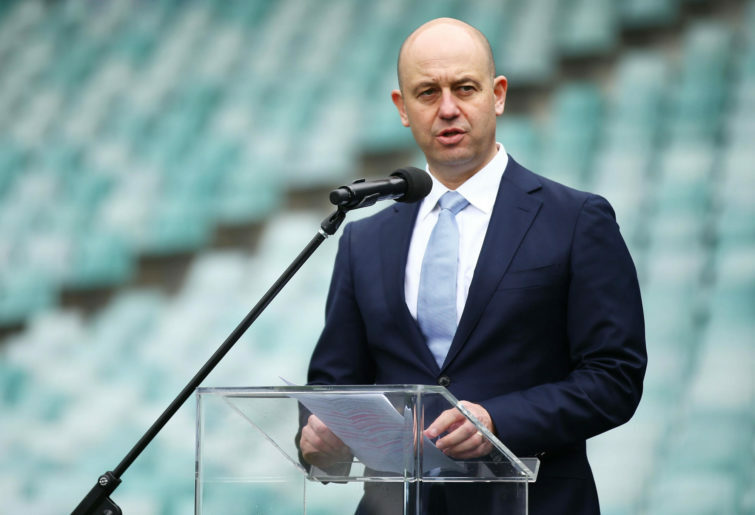 The NRL, with Greenberg at the helm, has ensured that this time, no success-hungry club can put footballing talent ahead of basic human standards of behaviour and effectively eliminate consequence. It is hoped that his partner and children can move forward and lead positive lives. Banning him from the NRL may do them no favours, no one really knows. However it may just be the start of sporting bodies making a real difference to the incidence of domestic violence. Again, writing an article on this subject is done with extreme caution, and an acknowledgement that the case against Barba remains an allegation only. However the decision to put this piece together is based on the view that it has to be better that society is now speaking about behaviour that once stayed mostly behind closed doors as a guarded secret within families, or worse, an issue that many turned their backs to. Instead, the allegation has called out domestic violence as unacceptable behaviour that can never be tolerated, and the NRL has turned its back on Barba, in the process setting a great example to young footballers and young people generally. 24 hour national sexual assault, family and domestic violence counselling line for any Australian who has experienced, or is at risk of, family and domestic violence and/or sexual assault. Call toll-free 1800 737 732 or visit 1800Respect.